Acoustic cabinet fans manufactured from heavy gauge galvanised steel sheet and internally lined with 25 mm thickness of fireproof acoustic insulation (M0). 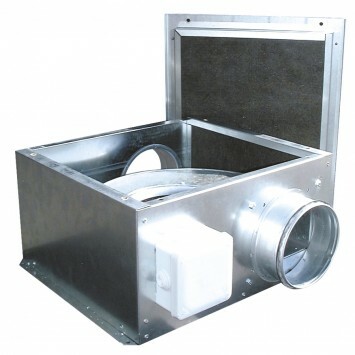 All models incorporate single phase direct-drive forward curved centrifugal fan. All cabinets are supplied with a removable cover closing hermetically and can be installed outdoors as standard. Fitted with single phase 2-speed motors. Models with sandwich type panels, manufactured with 50mm thickness of fireproof acoustic fiberglass insulation (M0), with sound-absorbent insulation.